Captain Arturo Prat Base is a Chilean Antarctic research station located at Iquique Cove, Greenwich Island in the South Shetland Islands, Antarctica. Opened February 6, 1947 by the First Chilean Antarctic Expedition, it is the oldest Chilean Antarctic station. Until March 1, 2006, it was a base of the Chilean Navy, on which date it was handed over to the regional government of Magallanes and Antártica Chilena Region. Until February 2004, it had been a permanent base. Afterwards, it had served as a summer base for ionospheric and meteorologic research. There have been plans to reopen the station for permanent occupation starting March 2008. The base is named for Captain Arturo Prat, a Chilean naval officer. A concrete monolith was erected in 1947 near the base as a point of reference for Chilean Antarctic hydrographic surveys. It represents an important pre-IGY activity in Antarctica, and is preserved and maintained by personnel from the base. It has been designated a Historic Site or Monument (HSM 32), following a proposal by Chile to the Antarctic Treaty Consultative Meeting. A shelter and cross with plaque was erected near the base and named after Lieutenant Commander González Pacheco, who died in 1960 while in charge of the station. It commemorates events related to a person whose role and the circumstances of his death have both symbolic and educational value relating to human activities in Antarctica. It has been designated a Historic Site or Monument (HSM 33), following a proposal by Chile to the Antarctic Treaty Consultative Meeting. A bust of Chilean naval hero Arturo Prat was erected at the base in 1947. It represents pre-IGY activities and has symbolic value relating to Chilean presence in Antarctica. It has been designated a Historic Site or Monument (HSM 34), following a proposal by Chile to the Antarctic Treaty Consultative Meeting. A wooden cross and statue of the Virgin of Carmel was erected in 1947 near the base. It represents pre-IGY activities and has both symbolic and architectural value. It has been designated a Historic Site or Monument (HSM 35), following a proposal by Chile to the Antarctic Treaty Consultative Meeting. L.L. Ivanov et al. Antarctica: Livingston Island and Greenwich Island, South Shetland Islands. Scale 1:100,000 topographic map. Sofia: Antarctic Place-names Commission of Bulgaria, 2005. ^ a b c d "List of Historic Sites and Monuments approved by the ATCM (2012)" (PDF). Antarctic Treaty Secretariat. 2012. Retrieved 2013-12-30. Wikimedia Commons has media related to Captain Arturo Prat Base. This Magallanes and Antártica Chilena Region location article is a stub. You can help Wikipedia by expanding it. St. Kliment Ohridski Base is a Bulgarian Antarctic base on Livingston Island in the South Shetland Islands. Discovery Bay is a bay 5 km (3 mi) long and 3 km (2 mi) wide, indenting the north side of Greenwich Island, in the South Shetland Islands of Antarctica. It had been known to sealers in the area since about 1821. It was charted and named in 1935 by Discovery Investigations personnel on the Discovery II. Pendulum Cove is a cove at the north-east side of Port Foster, Deception Island, in the South Shetland Islands of Antarctica. The name of the cove derives from the pendulum and magnetic observations made there by the British expedition under Henry Foster in 1829. Yankee Harbour is a small inner harbour entered from Shopski Cove between Glacier Bluff and Spit Point, indenting the south-west side of Greenwich Island in the South Shetland Islands, Antarctica. It is 2.35 km (1.46 mi) long in west-south-west to east-north-east direction, and 1.6 km (0.99 mi) wide, and is bounded by Provadiya Hook to the south-west, Parvomay Neck to the north and east, and Kladara Beach to the south. The Ibar Rocks are two rocks located 0.4 kilometres (0.2 nmi) east of Bonert Rock and 1 kilometre (0.6 nmi) southeast of Canto Point, Greenwich Island, in the South Shetland Islands. The names "Islote Ibar" and "Islote Teniente Ibar" appearing on Chilean hydrographic charts in the 1950s refer to the larger and western rock. The recommended name "Ibar Rocks" includes a submerged outlier to the northeast of the larger rock. Teniente (lieutenant) Mario Ibar P. signed the official act of inauguration of the Chilean Captain Arturo Prat Base on Greenwich Island in 1947. Iquique Cove is a small, 400 m (440 yd) wide cove indenting for 700 m (770 yd) the east coast of Discovery Bay, Greenwich Island in the South Shetland Islands, Antarctica. Iquique Cove is sheltered on the northwest by Guesalaga Peninsula, and the small González Island is situated on the south side of the cove's entrance. The cove is used by ships servicing the Chilean Antarctic base Arturo Prat. Shirreff Base, is a seasonal field station in the Southern Ocean operated by the United States opened in 1996. Situated on the east side of Cape Shirreff on Ioannes Paulus II Peninsula on Livingston Island in the South Shetland Islands off the Antarctic peninsula. Guesalaga Peninsula is a small, L-shaped, low-lying shingle covered peninsula on the east side of Discovery Bay, Greenwich Island in the South Shetland Islands, Antarctica forming the northwest coast of Iquique Cove and the north side of its entrance. The feature is projecting 700 m (766 yd) southwestwards and 300 m (328 yd) wide, with the narrow shingle Reyes Spit extending 400 m (437 yd) southwestwards from its west extremity Reyes Point into Discovery Bay. The Chilean Antarctic base Arturo Prat is situated on the peninsula. Poisson Hill is a rounded ice-free hill rising to 80 m at the north extremity of Breznik Heights, Greenwich Island in the South Shetland Islands, Antarctica and surmounting the Chilean Antarctic base Arturo Prat to the west-southwest. Angamos Hill is lying 370 m north-northeast of it and 850 m south-southeast of Ash Point. Risopatrón Base, also Luis Risopatrón Base, is a small Chilean Antarctic research base in the northwest of Robert Island in the South Shetland Islands, Antarctica situated on the isthmus linking Coppermine Peninsula to Alfatar Peninsula and bounded by Carlota Cove to the north and Coppermine Cove to the south. Established as a refuge in 1949 and opened as a base in 1954, the facility supports summer research in geology, geophysics and terrestrial biology. 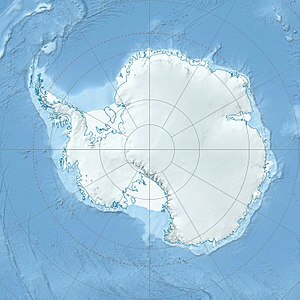 Point Wild is a point 11 km (6.8 mi) west of Cape Valentine, 2 km (1.2 mi) east of Saddleback Point, and directly adjacent to the Furness Glacier on the north coast of Elephant Island, in the South Shetland Islands of Antarctica. It was named Cape Wild by the Shackleton Endurance expedition 1914-16, but Point Wild is recommended for this feature because of its small size and to avoid confusion with Cape Wild on George V Coast. Half Moon Beach is a small crescent-shaped beach lying 1 nautical mile (2 km) south-east of Scarborough Castle on the north coast of Livingston Island, in the South Shetland Islands of Antarctica. The beach lieas at the western extremity of Porlier Bay in the north of Ioannes Paulus II Peninsula. Whalers Bay is a small bay entered between Fildes Point and Penfold Point at the east side of Port Foster, Deception Island, in the South Shetland Islands of Antarctica. The bay was so named by the French Antarctic Expedition, 1908-10, under Charcot, because of its use at that time by whalers. The Lame Dog Hut is a building in St. Kliment Ohridski Base on Livingston Island in the South Shetland Islands, Antarctica. Presently the oldest preserved building on the island, since October 2012 the hut has been hosting the Livingston Island Museum, a branch of the National Museum of History in Sofia. It was the first permanent building established by Bulgaria in Antarctica, which laid the foundations for Bulgaria’s systematic scientific research in the Livingston Island area under the Antarctic Treaty System. The building is a designated Historic Site or Monument of Antarctica.